“In 2013, 78% of the UK population said that they use the Internet. Does this large proportion of Internet users in Britain herald the rise of a common Internet culture, or are beliefs and attitudes about the Internet as diverse as opinions can be across the general population?” The OxIS 2013 report analyses ten years of the Internet in Britain. It addresses Internet adoption, diffusion and access, including digital households and mobility; characteristics and attitudes of Internet users; Internet use; government and politics; social networks and friendships; impact of Internet use; regulation and control; and digital divides. The 2011 OxIS report opens by describing the emergence of “next generation users” who are developing a new pattern of Internet use. It goes on to examine Internet diffusion; characteristics and attitudes of Internet users; how people with different backgrounds use the Internet; use of the Internet in politics and government; how the Internet is reshaping friendships and social networks; the social implications of Internet use; beliefs and attitudes of individuals about the control and regulation of the Internet; and the key issue of exclusion, either by social and economic divides or by personal choice, describing non-users and former users. “In 2009, the Internet celebrates its 40th anniversary, and the World Wide Web, its 20th. Since their inceptions, the Internet and Web have both moved well beyond their origins. Computer scientists and engineers, but also growing numbers of users and providers of Internet products and services, have reinvented the Internet and Web in fundamental ways.” The 2009 OxIS report opens by describing the diffusion of the Internet in Britain; then focusing on the key issue of exclusion, either by social and economic divides or by personal choice; how people with different backgrounds use the Internet; the social implications of different patterns of use; key policy issues of access; and beliefs and attitudes of individuals about the control and regulation of the Internet. 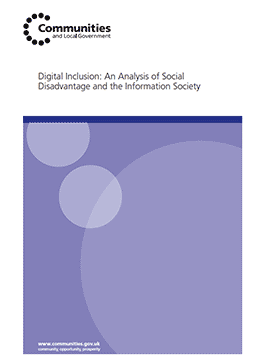 This study was commissioned to investigate the extent to which social exclusion and digital exclusion coincide, exploring the question of whether people who suffer significant social disadvantage also suffer digital exclusion, and if so what the key social drivers are that contribute to this. It was led by the OII, in partnership with the ONS and Ofcom. A framework was developed which was applied to 2007 survey data from the three organisations; the results were intended to help inform digital inclusion policy and actions. “In 2000, only about one third of Britons had access to the Internet. Many wondered if it was just a passing fad. By 2007, over two thirds have access to the Internet. 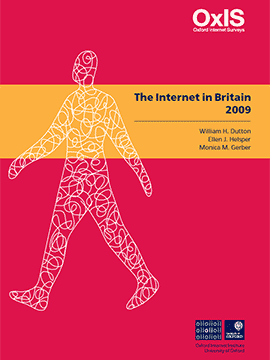 For many Britons, it has become an infrastructure of everyday life.” The 2007 OxIS report opens by describing users, ex-users and non-users, based on demographic characteristics, and uses of and attitudes towards ICTs. It then looks at how people with different backgrounds use and think about the Internet, focusing on Internet access and use, skills, proxy use, social networking and communication, creativity and production, learning, entertainment and leisure, and civic engagement and e-government. 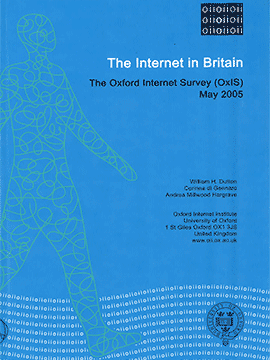 The OxIS 2005 report opens by describing Internet users, in terms of Internet adoption, levels and modes of access, technologies at home, mobile phone users, and experience and proximity to the Internet. The next section examines Internet uses, including for e-commerce, e-government, information production, and proxy use. The report then looks at impacts of the Internet on users, including changing information habits and Internet practices, the Internet and social interaction, use of time, centrality of the Internet, negative experiences and concerns, privacy, freedom of expression and norms of use, and shopping. The next section addresses regulation and governance of the Internet, including government versus self-regulation. The final section addresses digital divides, including digital inclusion, proficiency, technology and choice, social support and experience.